I was accepted to give a poster presentation entitled “No Gravity in My Poetry: Poetry Workshops as Social Emotional Literacy Learning” at 19th International CEC-DADD Conference on Autism, Intellectual Disability, and Developmental Disabilities. Donnie Welch, young caucasian male, stands in front of an academic poster title “No Gravity in My Poetry: Social Emotional Literacy Learning” He smiling and in a green turtle neck. Red conference lanyard around his neck. Images of students have been censored out using “hear no evil, see no evil, speak no evil” monkey emojis. It was a fascinating four days! Below are some brief, journal reflections from my time! Flew away from the snow in NYC to a 72 degree Tampa day. It felt nice to relax and settle in so that I didn’t have to balance my travel with the first day activities. I unpacked, went up to the fitness center (which was on the top floor with a gorgeous view of the coast) then explored around for dinner. Every restaurant around had a wait time! I ended up back at the Sheraton’s Mainstay Tavern which surprised me with its craft beer selection and really delicious food. I had a Grouper sandwich, apparently a must have dish in this part of the state according to my kindly lyft driver, and a salad with a house made raspberry vinaigrette. Not a bad start! Conference Materials for the CEC-DADD 2018 conference. At top is a red lanyard with a sponsors name on it, the name is blurred by a twist in the lanyard. Below the red lanyard is the program written in blue and pink text on a white, laminated booklet. At the bottom of the booklet is a picture of an island/beach sunset. To the right of this picture is a badge with “Donald Welch” on it and rainbow “presenter” ribbon attached. There was a sponsored luncheon between the pre-conference training sessions. Since those cost extra and were on topics I wasn’t too interested in I skipped those, giving me the morning to myself. I spent it preparing for my poster, figuring out what sessions I wanted to attend for the conference, and exploring Sand Key Park next door to the resort. Got my poster safe and sound with the help of a young concierge named Brent. A big relief to have it in my room and know it arrived! The Opening session was a nice reflection of education legislation and changes in Florida. While it was a little state specific, it was still cool to hear about the progress places are making around the country. It was also interesting to learn about some of the innovative post-secondary institutions that are popping like the Florida Center for Students with Unique Abilities. In fact, post secondary and transitions would prove to be a pretty large theme of the conference with quite a few posters and spoken presentations geared around that piece of education. After the opening came the first round of posters. I was glad to have the opportunity to be a spectator before I put mine up the next morning. It gave me a chance to listen to conversations and see the way people with more experience handled themselves and talked people through their presentations in a timely manner. In this session I met Dr. Christopher Denning from Umass Boston who was presenting “Piloting a Physical Activity Program for Young Children with Autism Spectrum Disorder.” He was really kind, listening to my rookie concerns about my presentation the next morning and then pointing me in the direction of some movement research that might be helpful for my workshops! Academic poster form Umass Boston. The title and subtitle blocked out by a light glare. The Umass Boston logo and color scheme, blue and white, are employed throughout. The lettering and charts are black on a white background. I had my poster up in the morning sessions and it was a fun, new experience. I really enjoyed the conversational tone of the presentation format and found that the hour and half block went by fast. I had a steady flow of people popping in and out to chat and listen. There was also a camaraderie with the other poster presenters that I didn’t necessarily expect. I had my neighbor presenters stopping in to chat and hear about my work and I did the same for them. Even though our work and perspectives were different, the whole vibe was a cordial, supportive, and helped take the edge off any nerves I had. After my session I stopped into the DADD Online Journal publication session where editor Dr. Stanley Zucker went over publishing in the DADD's online journal. As one of the people in the session who had no previous experience with academic publication, Dr. Zucker used my work as a walk-through example for turning a poster into a paper. While the process itself was for the benefit of the group, I found it personally, really beneficial as a I continue to draft my submission together. I then attended an amazing session facilitated by Dr. Elizabeth Harkins with Christine Scholma and Rebecca Kammes there in person and Dr. Gloria Nules and Dr. Rhonda Black video chatting in from Hawaii. 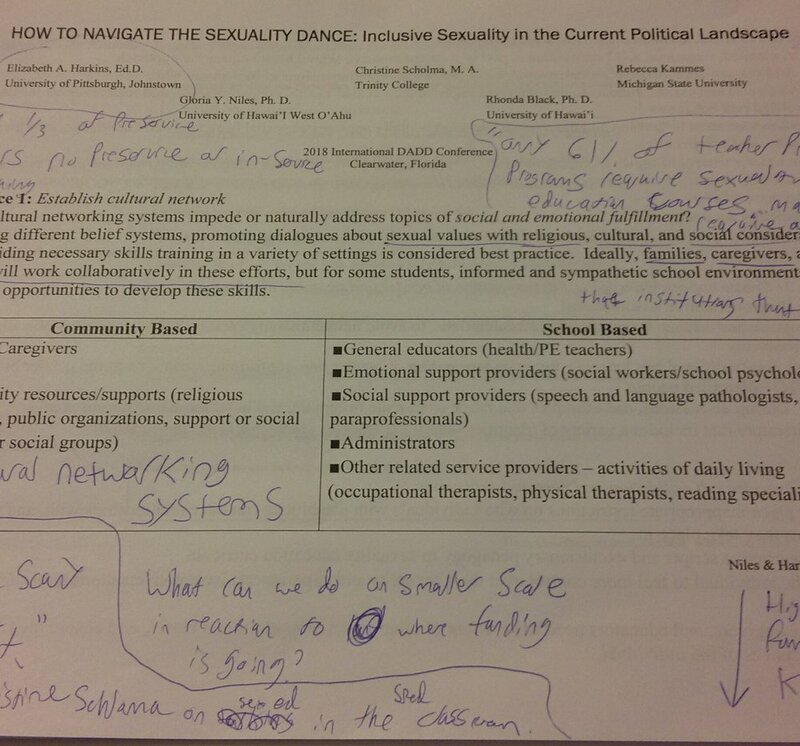 Their presentation, “How to Navigate the Sexuality Dance: Inclusive Sexuality in the Current Political Landscape,” was an informative presentation complete with actionable ideas for teachers, professors, family therapists, and really anyone working with students. “I say all the scary words first,” was my favorite piece of plain-spoken advice from Christine Scholma. Worksheet typed up in black ink on a white paper. Around the given, typed, information are handwritten notes in blue ink. Some of theses handwritten notes are circled or have arrows to help relate back to specific points in the typed information on the worksheet. Before lunch, I stopped in on a session led by Dianne Zager of the new Shrub Oak International School. The presentation “A Model for Transition Programming for High School Students with Autism” gave a rundown of various transitions models, offered ways they can be used together for greater success, and included a pretty robust discussion period with the attendees. The last sessions of the day ended at 4:30 leaving a lot of downtime to get dinner, relax, and explore around the resort. I wish there was more late night programming, but as someone much younger than the average attendee, perhaps I’m in the minority on that opinion. I know many attendees brought families along and probably appreciated the time to have a vacation with them. There’s this great scene in the documentary Woodstock where a person who attended the festival recalls Jimi Hendrix’s performance on the last day and says something to the effect of, “I was so tired I remember just wondering when he would stop.” This always stays with me. It could be the most ground breaking performance (like a re-imagining of the Star Spangled Banner) but at a certain point the energy just fades. I often feel this way at big conferences, to no fault of the organizers or presenters! I spent most of the morning poster session enjoying the continental breakfast, checking in for my flight, downloading my boarding pass, then taking care of odds and ends for my travel home. I attended a panel “Perspectives on Publishing Pre-Tenure: Advice from Experts in the Field,” that was (quite clearly) more for early career academics, but I still gleaned some good writing tips and listening to a group of people discuss their craft and writing habits was a nice, non-intensive activity on the last day. Dr. Elizabeth Harkins was leading another session with Dr. Gloria Niles video chatting in again, this one entitled, “Challenging Heteronormativity: Intersectionality of Gender, Sexuality, and Disability.” I enjoyed the first so much I decided to stop in and wasn’t disappointed! After another catered lunch (tacos!) I sat in on “The Science of Mindful Breathing” presented by Dr Amrita Chaturvedi, Dr. Nikki Murdick and Dr. Kristine Larson and learned some new breathing techniques, namely alternate nostril breathing, which, while easy enough to perform, but can be quite the head rush! The closing keynote was delivered by Robert Pio Hajjar, a self-advocate and author who offered his, “ I can, YOU can,” motivational speech as final call to action for the event. Black and white photo of a large, hotel, ballroom. In the foreground, a table with a pen and conference booklet, you can’t quite make out what it says. Beyond that are people sitting in chairs at round tables and listening to a closing keynote given by an older , male caucasian speaker at a podium. All in all it was a great time! More academic and research geared than I’m used to, but it was interesting to be among that section of the industry for a while and see the work people are doing in the field.